Looking for a Valentines Day Sunday School lesson? 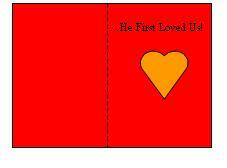 Find a free Sunday School lesson for Valentine's Day about God's Love for Us! Make a Valentine Card Craft! In 2020, Valentine's Day (February 14th) falls on a Friday. You have a room full of Little Guys coming to Sunday School just a few days before Valentine's Day and you need a lesson to teach them! What do you do? 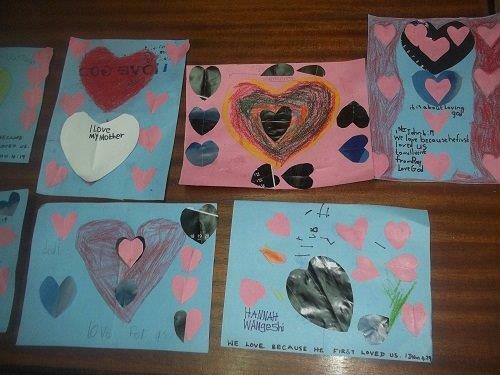 You might want to do a Valentine Card Craft with them following a fun Sunday School Lesson on God's Love for Us! This Valentine's Day lesson is designed for children (4-8 years of age) and, along with the suggested crafts and game/activity, should keep a room full of children occupied for up to an hour. We don't earn God's love, He gives it to us! Because God loves us, we can love Him back! 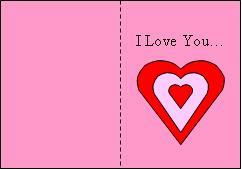 Three Valentine Card Crafts are included, which involve making Valentine Cards out of construction paper. 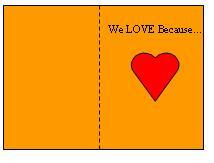 These are great fun, and besides... everyone enjoys receiving a Valentine Card! A couple of Game/Activity ideas are included that will help the children work off a little of that extra holiday energy AND learn their Bible Memory Verse! I just had to share my excitement with you! Children from my neighbourhood gather at my house every Saturday afternoon for Kids Bible Club. …there was a yearning in my heart to structure my lessons, but I did not know where or how I will get this kind of resource. I mentioned this to my friend, who is a teacher in various capacities. She told me about your website, and I checked it out... In a few words, this was ANSWERED PRAYER!! I chose the Valentine's lesson, and I keenly followed it, adding a couple of things here and there. The kids loved the study, especially doing the crafts. We ended the class one hour late!! I had 7 kids who attended (two are mine). Three parents told me that they were very happy with our lesson today, especially receiving a gift that their children made for them. IT WAS TRULY SPECIAL!! I took pictures of the "Love Cards" that they made, and I have attached them here for you to see. Thank you so much for this. For me, you are answered prayer! You have made it easy for me to teach children the Word of God. Yes, there is a lot of preparation, but it is such a joy to do it. May the Lord richly and truly bless you, for making an impact to some children at a Bible Club in Kenya. We love you!! God bless you as you lead the children to learn about one of the MOST important things we can ever teach them: God LOVES You! Oh... And Happy Valentines Day!